Barbecue Master: Are You Tired of Getting Those Grill Special Orders Mixed Up? Are You Tired of Getting Those Grill Special Orders Mixed Up? If your family is anything like mine, then you get special orders off your barbecue grill. One kid loves spicy sauce. The other hates spicy and wants the mild BBQ sauce. Mom likes her steak rare. Cousin Ben prefers his steak burned to a crisp (although I can't explain that). Now, there is a solution - grill charms. If you're familiar with wine charms, you get the idea. If not, don't fret, and I won't tell anyone you don't know about wine charms. Basically, grill charms are indvidual markers (about the size of a dime and with a toothpick-like stick in piece) that you press in the meats so that you know what's what on the grill. Leslie Haywood invented and designed these neat grill chef accessories. She told me that she doesn't actually "man" the grill. That may be a good thing. It's nice to have a break from cooking. Leslie does, however, help with the barbecue party planning, and she came up with this neat idea that helps keep things in order out on the deck. 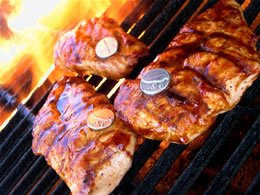 If you have a barbecue or grill geek on your holiday list or if your favorite griller has a birthday coming up, then Grill Charms are unusual and also useful items that will put a smile on the BBQ chef's face as well as making the party guests happy when they actually get what they wanted off the grill.